By Bradley J. Carra, M.D. and Paul M. Sherman, M.D. Spine neoplasms are classified based on their location as either extradural, intradural extramedullary (IDEM), or intramedullary. This review will focus on intradural neoplasms including both extra- and intramedullary. 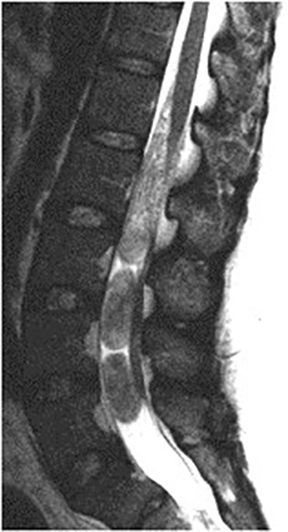 While neoplasms are relatively uncommon compared with other types of spine pathology, recognition of their imaging appearance and understanding the principles of spine tumor imaging is necessary as MRI is the primary tool for establishing a differential diagnosis, guiding the diagnostic workup, and formulating a treatment plan. 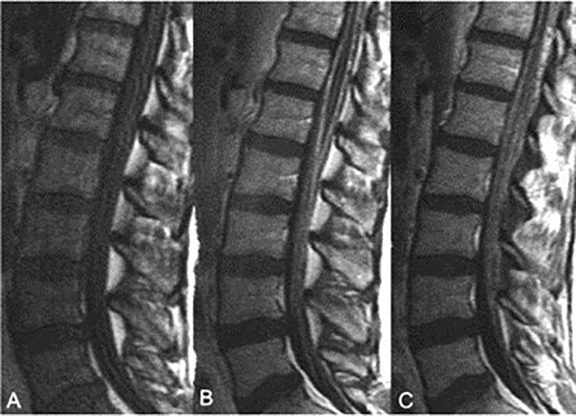 MRI is the imaging modality of choice for assessing the spine because of its high soft tissue contrast; therefore, its use will be emphasized in this review. The first step in forming a pertinent differential diagnosis is assessing the location of the abnormality. Intramedullary neoplasms are characterized by abnormal cord signal and expansion. IDEM tumors are contained within the thecal sac but displace rather than expand the spinal cord. A CSF cleft may be seen separating the tumor from the cord. Use of gadolinium based contrast agents should be standard in suspected spinal tumors. Enhancement is a hallmark of spine neoplasms and helps to differentiate tumor from cord edema and reactive cysts, an important distinction for surgical planning to limit the size of laminectomy to that of the tumor. Additionally, imaging of the entire neuraxis is necessary in suspected tumors as many metastasize through CSF dissemination, can be multiple as part of a syndromic disorder, or themselves may represent metastatic disease from other parts of the CNS. Many of the imaging features of IDEM neoplasms are nonspecific, which means most cases will have a list of differential considerations. In terms of intramedullary pathology, infection, demyelinating disease, vascular malformations, metabolic abnormalities, and other spine pathology, while not discussed further in this review, can have a similar appearance to cord tumors and should always be considered. When tumor is suspected, however, certain diagnoses can be favored based on lesion location, patient demographics such as gender and age, and select imaging findings. Intramedullary tumors represent 5-10% of all spine tumors and are more common in children.1 The most common primary intramedullary neoplasms are ependymoma, astrocytoma, and hemangioblastoma. Ganglioglioma, metastasis, and primary lymphoma are less common. Intramedullary neoplasms share many common imaging features. Abnormal cord signal intensity and expansion, whether from tumor itself or from cord edema, commonly spans several spinal levels, and may involve the entire spinal cord. Contrast enhancement is the rule, and unlike most intracranial neoplasms, even low-grade spinal tumors characteristically enhance. Syringohydromyelia and cyst formation is common. Two types of cysts exist: tumoral cysts and rostral/caudal cysts. The former are lined with neoplastic cells and typically demonstrate rim-enhancement; the latter are reactive and do not contain neoplastic cells or enhance. Distinction is important as the former need to be surgically resected while the latter can simply be aspirated. The majority of intramedullary neoplasms are low grade and slow-growing. Therefore, patients typically have a prolonged clinical course extending over many years prior to diagnosis. Common symptoms include back pain and sensory disturbances. In general, treatment consists of surgical resection, with or without adjuvant radiation and chemotherapy. Five histologic subtypes of ependymoma exist, including cellular, clear cell, papillary, tanycytic, and myxopapillary (discussed in the IDEM section). The cellular subtype is most common and is typically WHO grade II. Sensory symptoms predominate in the clinical presentation, possibly from involvement of the central crossing spinothalamic tracts. Ependymomas can be seen as part of neurofibromatosis (NF) type 2 (“MISME” syndrome — multiple inherited schwannomas, meningiomas, and ependymomas), though the majority are sporadic. Many imaging features suggest a diagnosis of astrocytoma over ependymoma. As opposed to ependymomas, astrocytomas are more characteristically eccentrically located and are less well-defined secondary to their infiltrative growth pattern (Fig. 2). MRI signal characteristics are similar, with T1 iso- to hypointensity and T2 hyperintensity compared to cord, though hemorrhage is less common. Partial mild-moderate intensity heterogeneous enhancement is characteristic, though no enhancement was seen in 20-30% in one series.9 Despite the lack of enhancement, neoplasm should still be suggested based on characteristic cord expansion and signal abnormality. MR imaging characteristics include a well- delineated, uniformly T2 hyperintense mass in smaller lesions. Location is subpial, typically along the posterior aspect of the cord. Cyst and syrinx formation are common, and the cyst-mural-nodule appearance classically seen in cerebellar hemangioblastomas may be seen with larger lesions (Fig. 3). Due to the highly vascular nature of this entity, enlarged feeding vessels and flow voids in larger masses may be seen. Uniform and intense enhancement is characteristic of smaller masses. Spinal cord metastases are uncommon, seen in only 0.9-2.1% of autopsied cancer patients in one series.14 They represent approximately 3% of metastases to the spine.15 The most common primary tumors are lung15 and breast and arise either through hematogenous dissemination or CSF spread through the central canal. The cervical cord is the most common site of involvement.16 Intratumoral hemorrhage may be seen with certain types of primary neoplasm. While they may be solitary, multiple lesions or multifocal involvement, including the osseous spine, may be key to distinguishing the diagnosis. Unlike primary spinal cord neoplasms, metastases tend to have a more rapid onset and disease progression, on the order of weeks to months rather than years. Prognosis is uniformly poor with life expectancy on the order of months, as this represents an advanced stage of disease. Imaging features vary based upon the primary tumor. Common features include a relatively small mass with extensive edema that is out of proportion for that expected based upon the size of the mass. Cord enlargement, if present, is not pronounced, and cysts are uncommon.16 Enhancement is common (Fig. 4). T1 hyperintensity can be seen with melanoma metastases and with hemorrhage. Lymphoma has a variety of disease patterns involving the spine, including osseous, epidural, leptomeningeal, and spinal cord involvement. Intramedullary spinal involvement is the least common, accounting for only 3.3% of CNS lymphoma cases.17 As in other areas of the CNS, non-Hodgkin lymphoma predominates over Hodgkin disease, though some of the reported cases of spinal lymphoma are of T-cell lineage,18 an atypical feature of CNS lymphoma. Cord involvement favors the cervical spine. 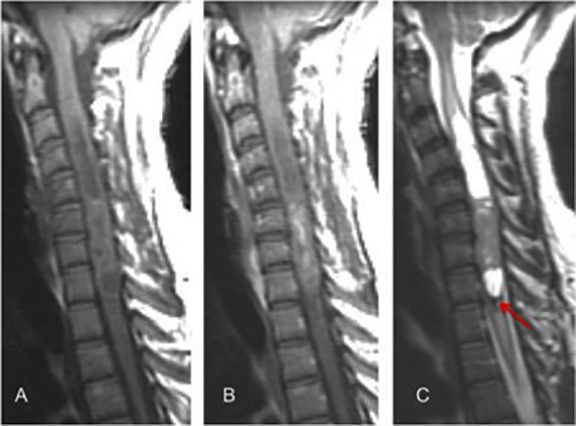 The MRI appearance is nonspecific with respect to other intramedullary neoplasms, typically demonstrating T1 isointensity and T2 hyperintensity to the spinal cord. The T2 hyperintensity reported in cases within the literature18 is in distinction to the typical T2 hypointenisty seen in primary lymphoma of the brain because of the high cellular content.19 Contrast enhancement is heterogeneous. Ganglioglioma is uncommon, accounting for only 1.1% of spinal neoplasms.20 It is a low grade slow growing tumor composed of a mixture of neoplastic neuronal and glial elements. Children are more commonly affected with a classic clinical presentation of painful scoliosis. 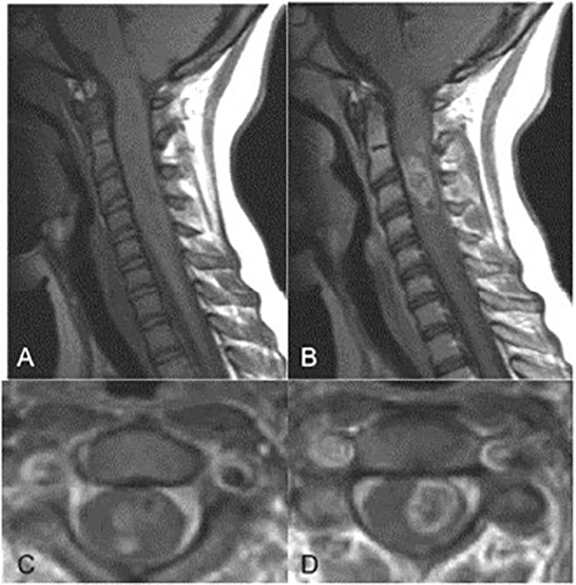 Cervicothoracic cord involvement predominates but holocord involvement is not uncommon. 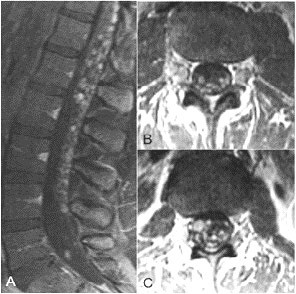 Several MRI findings are suggestive of gangliolioma.20 Length of involvement tends to be larger with an average of 8 vertebral segments, and they are eccentrically located within the cord. Enhancement is patchy with more than half demonstrating extension to the pial surface. Tumoral cysts are common. Signal intensity on T1-weighted images is heterogeneous, and the amount of cord edema is relatively unimpressive based upon the size of the tumor. IDEM tumors are more common in adults. Schwannomas and meningiomas are the most common, together accounting for 45% of all primary spinal cord neoplasms.21 The differential diagnosis also includes neurofibroma, malignant nerve sheath tumor, lymphoma, myxopapillary ependymoma, paraganglioma, and metastatic disease. Schwannomas arise from support cells of the nerve sheath and are the most common IDEM spinal neoplasm. Nerve sheath tumors account for 25% of all intradural spinal tumors in adults, with the majority being schwannomas.22 While they may occur in any spinal compartment, they are most commonly intradural and extramedullary in location within the thoracic or lumbar spine.23 The classic “dumbbell” lesion extending through the neural foramen is considered both intra- and extradural, occurring in 10- 15% of cases (Fig. 5).24 Most are solitary and sporadic. Syndromic associations include NF2, Carney complex, and schwannomatosis. Schwannomas are typically low grade (WHO grade I) tumors. Total resection of an intradural schwannoma is considered curative. Meningiomas are the second most common IDEM spinal neoplasm. They arise from arachnoid cap cells within the dura and are most commonly seen in females in the 5th-7th decades of life.22 The majority are solitary and sporadic; however, there are multiple syndromic associations, the most common of which is NF2 (see “MISME” in ependymoma section above). Thoracic cord involvement is typical and unlike schwannomas, cystic degeneration is uncommon. WHO grade I tumors are by far the most common, and total resection is generally curative. Meningiomas are typically seen as well circumscribed masses along the ventral or ventrolateral aspect of the cord (Fig. 7). MR signal characteristics include T1 iso- and T2 iso- to hyperintensity relative to the spinal cord. A broad dural attachment, or “dural tail”, was seen in 58% of meningiomas in one series, best demonstrated on post-contrast imaging.23 In this same series, calcification, which is easily identified on CT, was also identified in 58%. Post-contrast imaging typically reveals diffuse and prominent enhancement. A solitary IDEM thoracic spine mass in a middle-age female should suggest the diagnosis. Neurofibromas are much less common than schwannomas within the spine. They are most commonly seen in the 3rd-4th decades of life and have no gender predilection.1 The classic association of NF1 with plexiform neurofibroma is virtually pathognomonic. However, the majority of lesions are sporadic. They can be intradural and/or extradural and can be seen at any spinal level. Neurofibromas are WHO grade I neoplasms. While total resection is considered curative, tumors with extensive paraspinal involvement and subtotal resection have a propensity to recur and require follow up imaging. It is often difficult if not impossible to distinguish solitary spinal neurofibromas from schwannomas based on imaging alone. Peripheral T2 hyperintensity, the “target sign,” is more suggestive of neurofibroma but not pathognomonic (Fig. 8). Cystic degeneration and hemorrhage are also less common than schwannoma. Involvement of a ventral nerve root is more suggestive of neurofibroma.1 Extradural extension can be prominent as a plexiform or infiltrative soft tissue mass. Malignant peripheral nerve sheath tumor (MPNST) represents a soft tissue sarcoma with histologic features of peripheral nerves either occurring de novo or arising from malignant degeneration of a neurofibroma. They are WHO grade II-IV tumors. Roughly half are associated with NF1 while the remainder are sporadic.1 They most commonly involve the paravertebral soft tissues with rare intraspinal involvement. Masses are typically markedly heterogeneous and infiltrating (Fig. 9). Prognosis is poor. 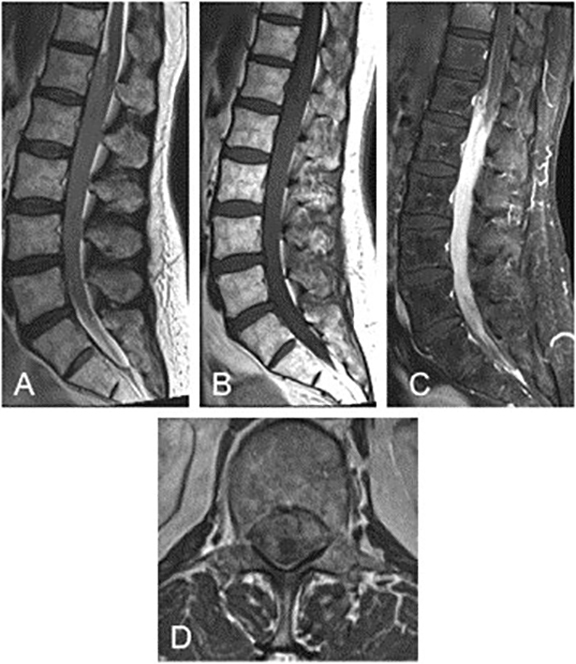 The myxopapillary variant represents roughly 30% of all intraspinal ependymomas.25 It can be distinguished based on its characteristic location within the conus medullaris, filum terminale, or cauda equina where it is the most common tumor. Peak incidence is in the 3rd-5th decades of life, and there is a slight male predominance.1 Despite its WHO I grading, it may cause subarachnoid seeding. Hemorrhage, calcification, and cyst formation are common. The tumor can become intimately involved with the nerve roots of the cauda equina making total resection difficult. When accomplished, recurrence rates are low. Myxopapillary ependymomas are sausage-shaped masses that can occupy the entire lumbosacral canal (Fig. 10). 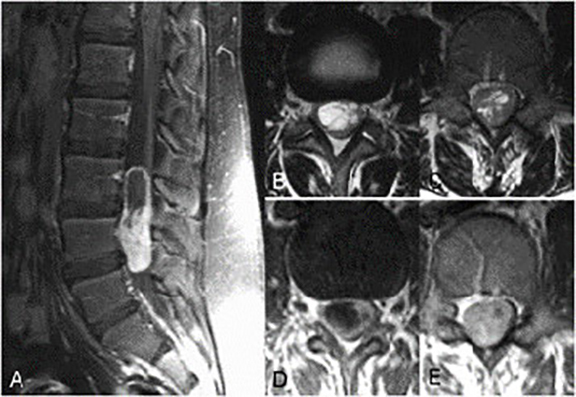 Unlike other histologic variants of spinal ependymoma, the myxopapillary type may have intrinsic T1 hyperintensity secondary to its high mucin content, seen in 67% of cases in one series.5 Other imaging features, such as the hemosiderin cap and intralesional flow voids, are similar to other ependymoma variants. As discussed above, spine lymphoma has a variety of different disease patterns, which include leptomeningeal involvement. The majority occur as spread from intracranial lymphoma. Patient demographics are similar to that of other types of lymphoma, most commonly occurring in middle age adults. Imaging hallmarks include thickened nerve roots and smooth or nodular leptomeningeal enhancement; IDEM mass formation can occur in extreme cases (Fig. 11). Paragangliomas are neural crest tumors of which the intra-adrenal form, pheochromocytoma, is the most common. Extra-adrenal paragangliomas most commonly occur in the head and neck near the carotid bulb, jugular foramen, and within the temporal bone. When they occur in the spine, they are characteristically located within the lumbar spine, involving the cauda equina or filum terminale where they are almost always non-secreting. 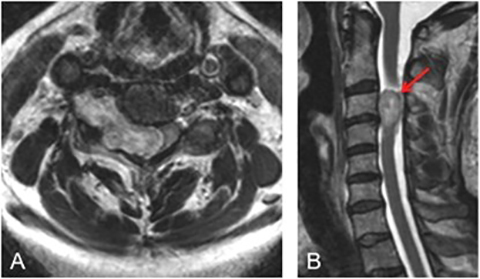 Paragangliomas typically appear as a well-circumscribed mass within the cauda equina. They are T2 hyperintense and highly vascular (Fig. 12). Hemosiderin cap and flow voids may be seen in larger lesions. MR imaging features are nonspecific and may mimic myxopapillary ependymoma, schwannoma, and meningioma, which are much more common. The diagnosis can be suggested with avid uptake on nuclear medicine metaiodobenzylguanidine (MIBG) scan. CSF seeding with malignant cells may occur through a hematogenous route or may represent spread from a CNS primary. The most common primary malignancies outside of the CNS include lung, breast, and melanoma.26 CNS primary tumors with a tendency for CSF dissemination include high-grade astrocytomas, ependymomas, germ cell tumors, medulloblastomas, and choroid plexus neoplasms. Imaging findings mirror patterns of disease involvement, which include solitary masses (Fig. 13), diffuse smooth or nodular coating of the cord and nerve roots (Fig. 14), and thickening of the cauda equina. Use of intravenous contrast increases the sensitivity for detection of metastatic lesions. MRI is an important adjunct to lumbar puncture with CSF analysis in diagnosing CSF metastasis; cytology alone has a significant false-negative rate and frequently must be repeated. It is important to remember, however, that chemical meningitis can cause enhancement and thickening of nerve roots, mimicking metastatic disease. Imaging should therefore precede lumbar puncture and craniotomy. While neoplasms are a relatively uncommon form of spine pathology, recognition of their imaging features plays an essential role in providing a meaningful differential diagnosis and guiding further evaluation and treatment. While many of the imaging characteristics are nonspecific with significant overlap, when tumors are suspected, certain diagnoses can be suggested based upon location, clinical and patient demographics, and certain specific imaging features. Parsa AT, Lee J, Parney IF, et al. Spinal cord and intradural- extraparenchymal spinal tumors: current best care practices and strategies. Journal of Neuro-Oncology. 2004; 69: 291-318. Helseth A, Mork SJ. Primary intraspinal neoplasms in Norway, 1955-1986. A population-based survey of 467 patients. J Neurosurg. 1989;71:842-845. McCormick PC, Torres R, Post KD, et al. Intramedullary ependymoma of the spinal cord. J Neurosurg. 1990; 72: 523- 533. McCormick PC, Stein BM. Intramedullary tumors in adults. Neurosurg Clin North Am. 1990;1:609-630. Kahan H, Evelyn ML, Sklar M, et al. : MR Characteristics of Histopathologic Subtypes of Spinal Ependymoma. AJNR. 1996; 17(1): 143-150. Innocenzi G, Raco A, Cantore G, et al. Intramedullary astrocytomas and ependymomas in the pediatric age group: a retrospective study. Child Nerv Syst. 1996; 12: 776-780. Houten, JK, Cooper PR. Spinal cord astrocytomas: presentation, management and outcome. Journal of Neuro- Oncology. 2000; 47: 219-224. Cohen AR, Wisoff JH, Allen JC, et al. Malignant astrocytomas of the spinal cord. J Neurosurg. 1989; 70: 50-54. Seo HS, Kim JH, Lee DH, et al. Nonenhancing intramedullary astrocytomas and other MR imaging features: A retrospective study and systematic review. AJNR. 2010; 31(3): 498-503. Browne TR, Adams RD, Roberson GH. Hemangioblastomas of the spine cord. Review and report of five cases. Arch Neurol. 1977; 33: 435–441. Sora S, Ueki K, Saito N, et al. Incidence of von Hippel-Lindau disease in hemangioblastoma patients: the University of Tokyo Hospital Experience from 1954-1998. Acta Neurochir. 2001; 143: 893-896. Conway JE, Chou D, Clatterbuck RE, et al. Hemangioblastomas of the central nervous system in von Hippel-Lindau syndrome and sporadic disease. Neurosurgery. 2001; 48: 55-63. Padhi S, Sarangi R, Challa S, et al. A 10-year retrospective study of hemangioblastomas of the central nervous system with reference to von Hippel-Lindau (VHL) disease. Journal of Clinical Neuroscience. 2001; 18: 939-944. Costigan DA, Winkelman MD. 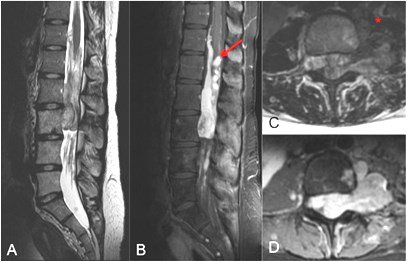 Intramedullary spinal cord metastasis: a clinicopathological study of 13 cases. J Neurosurg 1985; 62: 227-233. Edelson RN, Deck MDF, Posner JB. Intramedullary spinal cord metastasis. Clinical and radiographic findings in nine cases. Neurology. 1972; 22: l222–1231. Lowe GM. 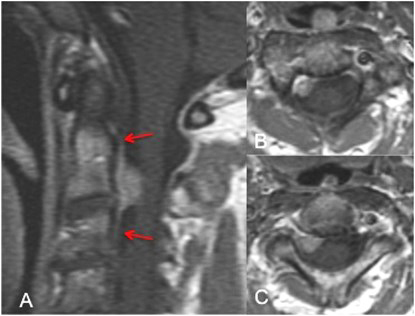 Magnetic resonance imaging of intramedullary spinal cord tumors. J Neuro-Oncology 2000; 47: 195-210. Koeller KK, Smirniotopoulos JG, Jones RV. Primary central nervous system lymphoma: radiologic-pathologic correlation. RadioGraphics 1997; 17: 497-1526. Urasaki E, Yamada H, Tokimura T, et al. 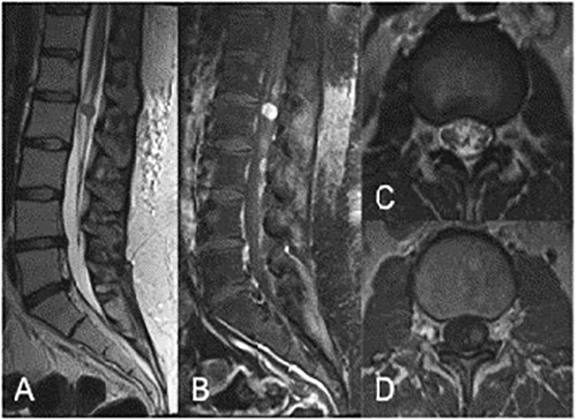 A T-cell type primary spinal intramedullary lymphoma associated with human T-cell lymphotropic virus type I after a renal transplant: case report. Neurosurgery 1996; 38: 1036-1039. Koeller KK, Rosenblum RS, Morrison AL. 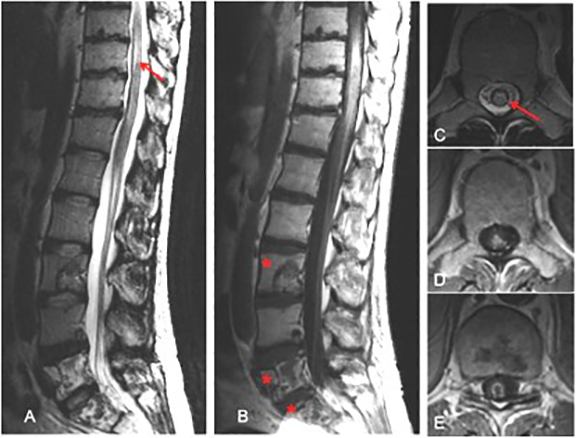 Neoplasms of the spinal cord and filum terminale: Radiologic-pathologic correlation. RadioGraphics. 2000; 20: 1721-1749. Patel U, Pinto RS, Miller DC, et al. MR of spinal cord ganglioglioma. AJNR 1998; 19: 879-887. Abul-Kasim K, Thurnher MM, McKeever P, et al. 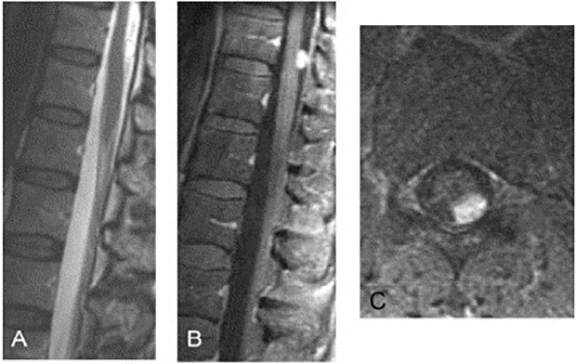 Intradural spinal tumors: current classification and MRI features. Neuroradiology 2008; 50: 310-314. McCormick PC, Post KD, Stein BM. Intradural extramedullary tumors in adults. Neurosurg Clin N Am. 1990; 1: 591-608. Liu WC, Choi G, Lee SH, et al. Radiological findings of spinal schwannomas and meningiomas: focus on discrimination of two disease entities. J Eur Radiol. 2009; 19(11): 2707-15. McCormick PC. Surgical management of dumbbell tumors of the cervical spine. Neurosurgery. 1996;38: 294-300. Wagle W, Jaufman B, Mincy JE. Intradural extramedullary ependymoma: MR pathologic correlation. J Comput Assist Tomogr 1988;12(suppl 4): 705-707. Wasserstrom WR, Glass JP, Posner JB. Diagnosis and treatment of leptomeningeal metastases from solid tumors: Experience with 90 patients. Cancer. 1982; 49: 759 –772. Carra BJ, Sherman PM. Intradural Spinal Neoplasms: A Case Based Review. J Am Osteopath Coll Radiol. 2013;2(3):13-21. Bradley J. Carra, M.D. and Paul M. Sherman, M.D. Drs. Carra and Sherman work with the Department of Radiology, Wilford Hall Ambulatory Surgical Center, Joint Base San Antonio-Lackland, TX ; Dr. Sherman also works with the Department of Radiology, Uniformed Services University of the Health Sciences, Bethesda, MD.